I didn’t get submissions till late last night, so I thought I would wait till this evening to throw up this sky pirate. 5 painters trying 6 different color schemes; they turned out really well. 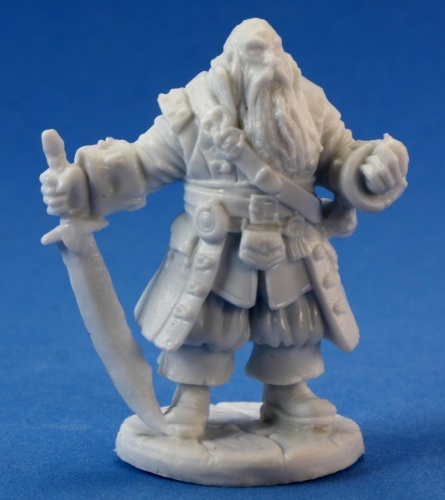 Conan – need some Hyperborian miniatures? Kickstarter has a deal for you. 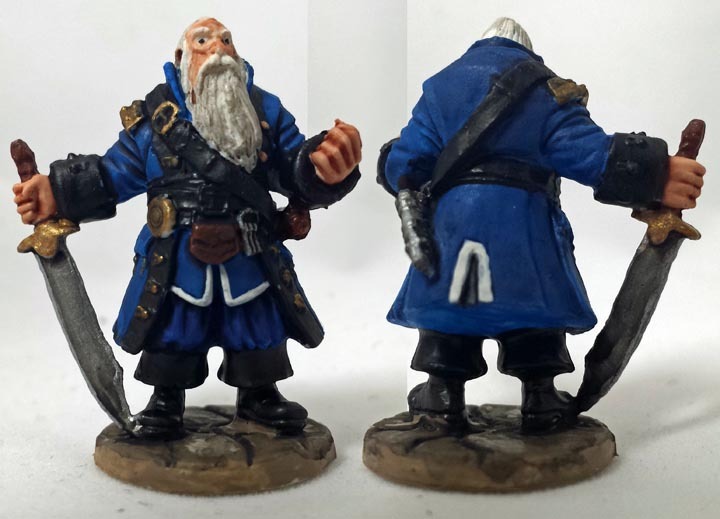 I tried to go with the naval officer theme, I like how the blue came out, but I wish I had chosen a different color besides black for the trim – it looks so flat. Also. 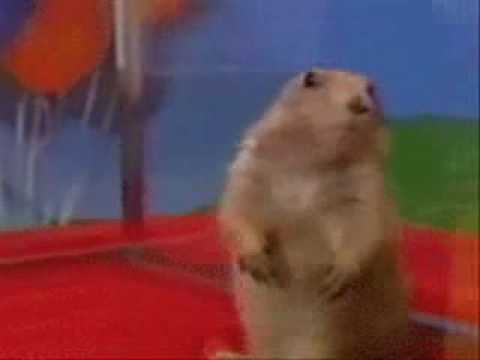 I feel like my min has a certain resemblance to this guy. I think this is Magnus’ best mini to date. Good color scheme and great shading! 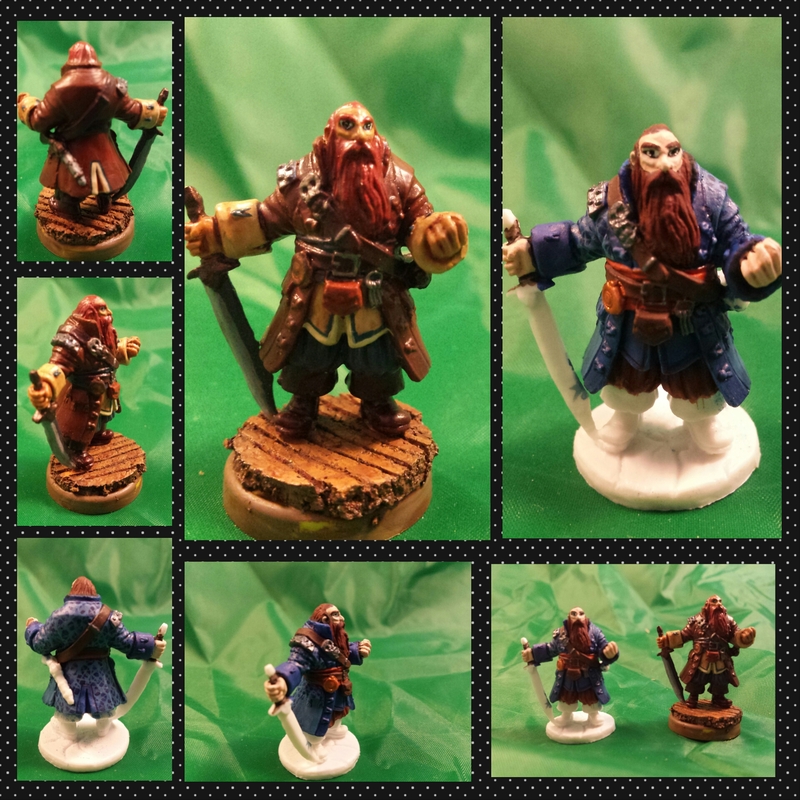 Jes painted one metal mini ages ago, and started working on the bones mini this week, but ran out of time. 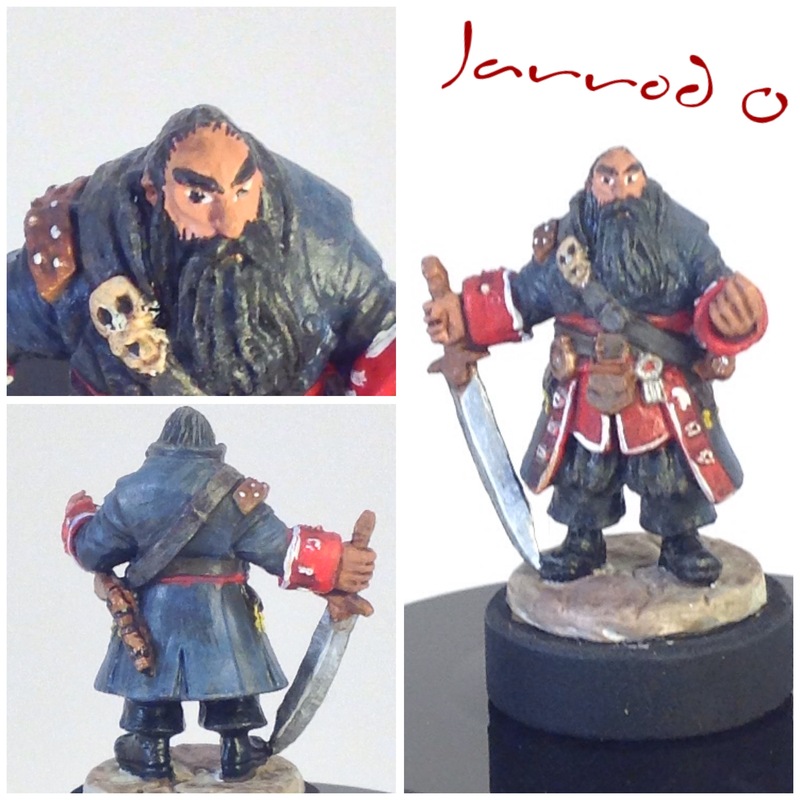 Jarrod’s pirate looks annoyed, and the color scheme makes me think communist. 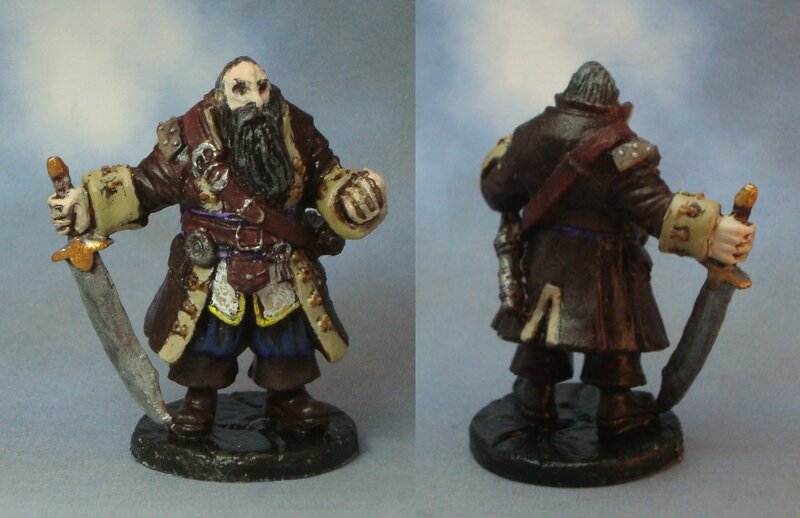 Arjen’s mini looks a little more refined, also, the pale skin realy contrasts with the tone of the sculpt and leaves it feeling very creepy. Large Earth Elemental – This one wasn’t a part of the vampire back, but it is a great mini with plenty of detail for the experienced model, and plenty of simple techniques could make it great as a bigineer. If you don’t have it, it’s only 7 dollars – you should pick it up. I was emailed a couple of suggestions last week – but the reaper website was down. Please continue to send me your suggestions. I’d like to keep these posted at least a month out. 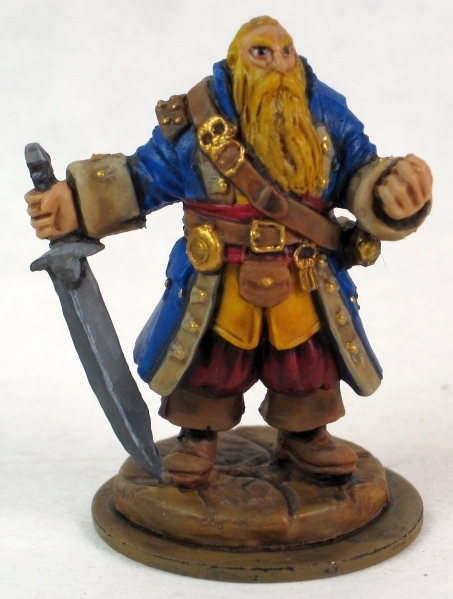 I like the darker tones the others took, as it makes the figure look like a stand-in for Blackbeard. Nice work! I wish the large earth elemental was available. I’ve been wanting one for months. Maybe I’ll try to hit up eBay if no one has one they want to part with. I hope they are sold out due to people pursuing then to paint for this blog next month. Also, I think I have one I can give up, let me look around tonight. I hadn’t thought about that, but since restock of existing Bones figures is on hold, that might make it hard to pick up additional figures at retail. We may need to hold off on including non-Vampire figures for now, at least until Bones II starts shipping and Reaper can get their supplies restocked. That said, I do have the Earth Elemental figure and look forward to painting it up! I think Magnus’ mini has very nice texture on the clothing: it looks soft and comfortable. Well done. I ordered the earth elemental from ebay. Shipping costs are killing, as usual, but I only have an ULGS here without Bones. Nearest store with Bones was in France. Added the ettin and the Forest spirit (treant), to spread the shipping costs. Looks like we’re doing the forest spirit in a couple months!